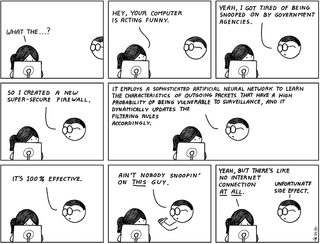 Leave it to the folks at Abstruse Goose to deliver one of the most tragicomically honest observations on the current state of NSA surveillance. The NSA&apos;s website for kids isn&apos;t creepy. Nope. Not creepy at all. I'm pretty sure if the NSA put their massive minds to it, they could figure out how to hear us thinking, let alone typity-typing on our computers without an internet in sight. Did you know that NSA is the country's largest employer of mathematicians? It is. Respect their powers.